Ionarts: Touring 'Merchant' Makes Quick Visit to D.C.
Shakespeare’s The Merchant of Venice has proven a burdensome undertaking for some local companies over the past decade. With its anti-Semitic themes and ambiguous hero/villain distinctions, it is a play that requires directors and actors to make clear choices, in order to keep the production from seeming anti-Semitic as a whole. A talented company from Shakespeare’s Globe has brought their touring version, directed by Jonathan Munby, to the Kennedy Center’s Eisenhower Theater, and while one does walk away with many questions, there is no trace of pandering, bigotry, or public service announcements. The play opens with Antonio, a wealthy merchant, and his friend Bassanio. Bassanio, having fallen in love with a beautiful Venetian woman named Portia, needs money to pay his debts. 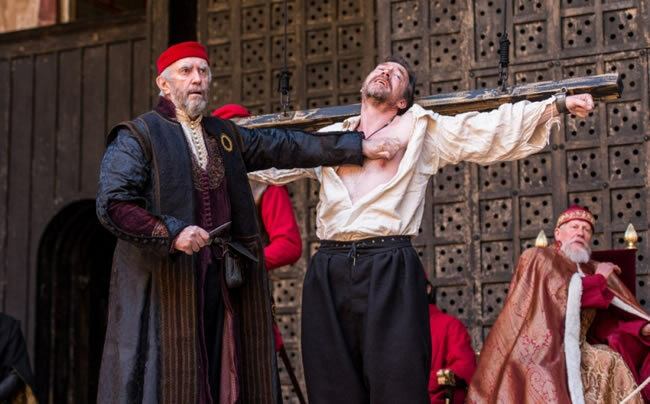 Antonio confesses to being cash-poor but agrees to bond Bassanio’s debt if Bassanio can find a lender. Here we are introduced to Shylock, a wealthy Jewish merchant who, after some back and forth regarding Antonio’s folly in lending out money so freely, agrees to lend Bassonio the needed amount without interest. Shylock does lay one condition upon the agreement, made somewhat in jest: if Bassanio cannot pay back the loan at a determined date, Shylock shall have a pound of Antonio’s flesh. The key to everything is the conflict between Antonio, a Christian, and Shylock, a Jew. As we find out, the debt between them is trivial compared to their personal conflict. Taking the helm of this production is Jonathan Pryce as Shylock. Pryce, known most recently for his portrayal of the High Sparrow in HBO’s smash hit Game of Thrones, obviously brings name recognition to the production, but more importantly he brings a refreshing take on a complex character. Shylock lives in a world where he is openly spat on, abused, and mocked. He has spent his life in a society not made for him and has still done well in terms of wealth and property. This character is often portrayed with moments of rage and a thirst for revenge, and while slightly two-dimensional, those qualities can work in this play. Knowing that Shylock has lived in a world where he is small and seemingly weak to those around him, Pryce has instead provided a character whose subtle workings and speeches landed without effort, needing only sparing use of excessive volume. When mocked by Antonio, he accepted it with a slight grin. Pryce has transformed a character usually associated with rage and revenge, into a character seeking justice through the simplest forms of logic and legalities. Pryce did provide moments of great anger and lashing out, but because they were limited, they became that much more poignant. Supporting Pryce's Shylock is a fairly talented cast. Rachel Pickup, portraying Portia, provided pace and lightness, while at the same time creating some desperately needed fun moments with her maid Narissa, played by Dorothea Myer-Bennett. When it comes to fun, none in the cast compared to Stefan Adegbola, portraying the servant Launcelot Gobbo. Caught in his own moral dilemma, Adegbola was the play's adrenaline rush. His mastery of the “aside” was a highlight of the evening, except for the unsuspecting audience members who were pulled on stage. Adegbola gave the play a true sense of Shakespearean convention, along with a very strong opening, complete with live music (composed by Jules Maxwell), as actors mingled in the house with no grand announcement over the speakers that the play was starting. While Act I did drag two-thirds of the way through, the best was truly saved for last where Munby added a scene that doesn’t appear in the text, Shylock's forced baptism. The company processed in as if at the beginning of a Catholic mass, singing Latin with thunderous instrumental support. Shylock, standing center stage in a simple white robe (an ode to the High Sparrow), resisted uttering the Latin phrase “Credo,” signifying he had accepted his new Christian faith. Knowing he must, he barely let the word escape his mouth. As the water was poured over his head, there was no sense of cleansing, as the water instead seemed to burn Shylock to the core. While a simple moment and one all contemporary eyes have seen, this outward sign of Christian faith was transformed into the most tragic form of torture. The Merchant of Venice continues at the Kennedy Center’s Eisenhower Theater through Saturday evening. The play runs roughly 3 hours with a 15-minute intermission.